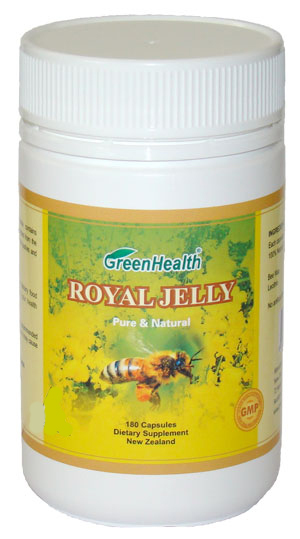 Royal Jelly is a highly nutritious dietary supplement rich in protein and anti-stress B Vitamins. It can help stimulate the body's metabolism, energy and stamina levels and assist in the management of cholesterol. Royal Jelly is the highly nutritious food given to young growing bees and the beehive’s most important resident, the queen bee. It contains the naturally occurring substance 10 H.D.A and promotes a sense of wellbeing. Research shows that Royal Jelly supports and assists the body's immune system, thereby helping the body to combat the effects of aging and stress. Each Capsule contains Royal Jelly (as extract equiv to fresh) 1000mg. ( 6% Auctive10 H.D.A), Bee's wax, Lecithin, encapsulating aids. No artificial flavorings, colourings, preservatives, sugar, salt, corn, yeast, gluten lactose added. Made in New Zealand from local and imported ingredients. Store below 30º C in a cool dry place. This product is not recommended for asthma and allergy sufferers as it can cause severe allergic reactions. The young nurse bees make royal jelly, it is a secretion from glands on the tops of their heads. For 2-3 days, royal jelly is the only food given to all young larvae in their maturation process, while for the queen larvae, it is the specific food for their whole life period. During the 3 days in which the worker bee larvae are fed on royal jelly, they reach the maximum development; their weight multiplies about 250 times. The queen (fed only on royal jelly for her entire life) reaches maturity 5 days earlier than the worker bees; and, when she is fully grown, her weight is double that of the working bee. The span of the worker bee's life is about 35-40 days; while the queen lives 5-6 years and is extremely prolific. She is fertilized once, and from that moment on can lay as many as three thousand eggs a day during the season. As incredible as this may seem, she can lay that many eggs for five years. Any creature that has that amount of energy and vitality has to be respected!